We can construct a flip-flop using two linked lazy points and a sprung point. 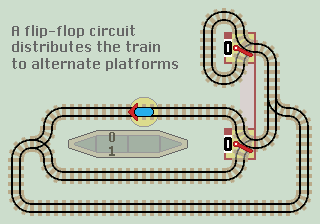 Trains arriving on the main line (from the right) pass up to an inverter loop and 'flip' (invert) the flip-flop. They then exit via the lower lazy point on alternating branch lines. Adam Chalcraft and Michael Greene in their paper 'Train Sets' name the flip-flop circuit as a 'Distributor'. Also see equivalent circuits and Duplo page for a flip-flop Duplo layout. In theory, all functions can be constructed using flip-flops alone, but this can require many more points. Also, as each flip-flop requires 3 points to build, they are not the most efficient way to create many functions. Connecting flip-flops in series creates a Count Up (increment) circuit. This has the same operation as Count Up function. The layout is similar to an Inverter function. The train increments the counter and returns back along the same track. The counter rolls over from 7 (111) to 0 (000). A more compact flip-flop can be built using three linked lazy points. The central point is drawn reflected. This counter is shown with an overflow line instead of rolling over. This layout inverts register A. The flip-flops are shown without the short vertical track between lazy points, which remain linked together. Also see Subtract function.